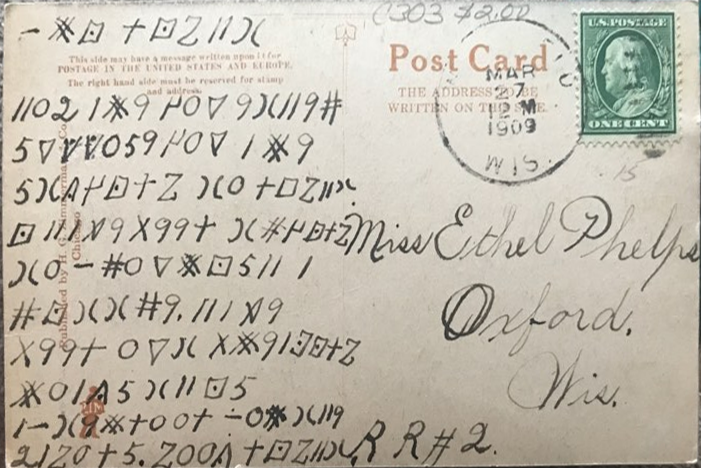 Who can decipher this encrypted postcard from Wisconsin? 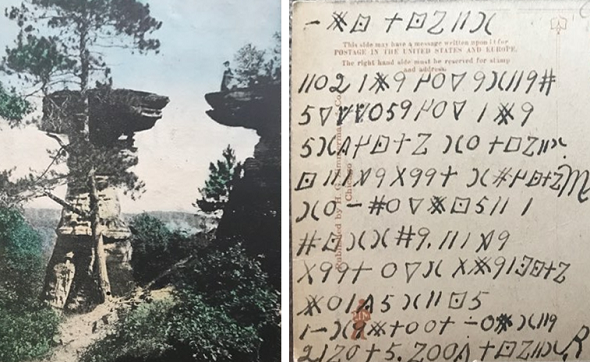 A postcard from 1909 bears an encrypted message and an unusual spelling of a remarkable rock. 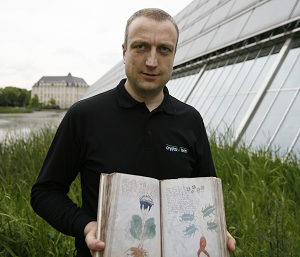 Can a reader solve these mysteries? Here’s a video of the same place. It proves that dogs are sometimes more reasonable than humans. Suprisingly, the place is called “Stank Rock” here. Is this a typo? Or is it an old name of the rock? In addition, it would be interesting to learn what B352B4 and 881 mean? Maybe a reader knows more. Apparently, this postcard is encrypted. 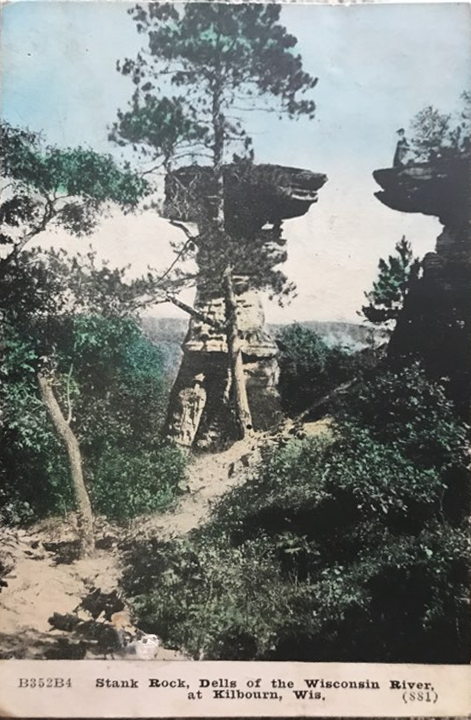 It was sent by an unknown person to some Ethel Phelps in Oxford, Wisconsin. Oxford is located some 20 miles away from Kilbourn. As can be seen on the stamp, the card was sent on March 27, 1909. The name of the place is not readable (it could be Oxford, too). 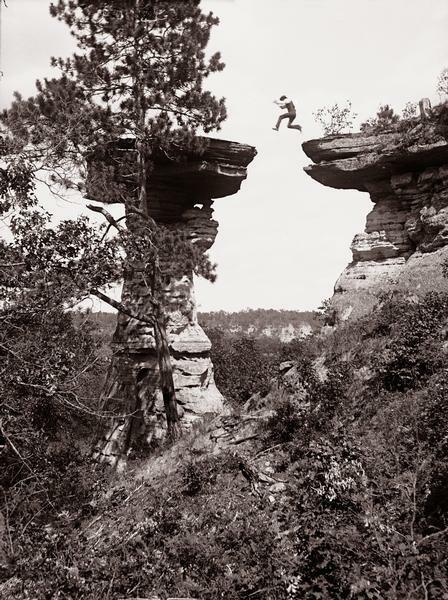 Experience shows that most encrypted postcards were sent by young men to their spouses. Considering that the recipient was female and unmarried (indicated by the word “Miss”), I am pretty sure that this is the case here, too. The encryption method used by the unknown sender is probably a monoalphabetic substitution cipher (MASC). The spaces between the words are not visible (or at least hard to spot), which makes deciphering a little more difficult. Apart from this, I don’t think this cryptogram is hard to break. Can a reader solve it? Further reading: Who can solve this encrypted postcard from Transylvania? 27.03.1909 is a Saturday, so Fri Night (first line) fits as the day the letter was written. In line 4 are two errors, a missing symbol and a wrong symbol (square without dot in the middle. Thank you very much, great job! I just wanted to comment that “RR#2” is part of the postal mailing address (on the right), not part of the ciphertext (on the left). @Tony: Thanks for clarification! Interesting read.